Every afternoon while Indigo takes his nap, I sit down with a cup of tea and work on my latest craft/DIY project. It’s so relaxing to take some time out of the day and to do something enjoyable for myself. It’s also re-charges me for the rest of the day. 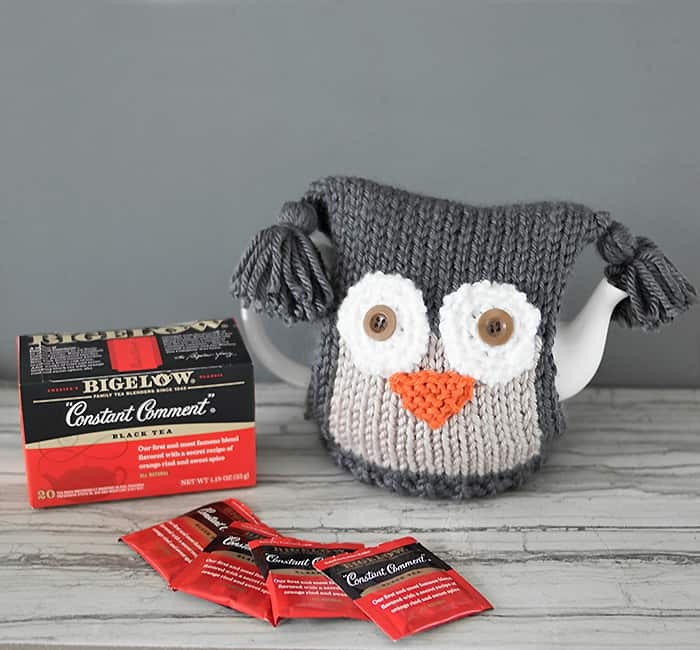 Today I teamed up with Bigelow to show you how I “Tea Proudly” and to share this Owl Teapot Cosy knitting pattern. I have a “tea time” ritual that I do every day. I always use a teapot (rather than the microwave) to heat the water. Teapots heating up on the stove always remind me of my mom and grandmother. When I was a child, they would sit at the dining table and have a cup of tea every time they got together. 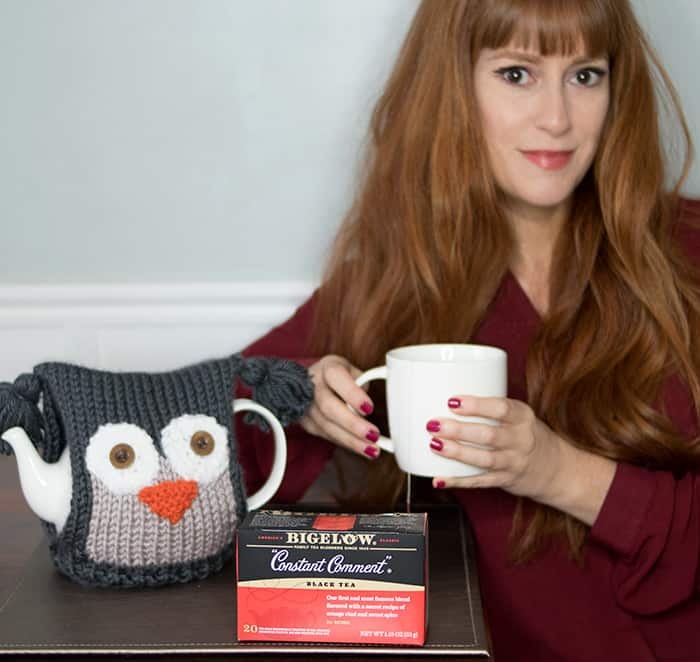 I have a different favorite Bigelow tea for each season. In the colder months I love Constant Comment. It’s black tea flavored with orange rind and sweet spice. It really hits the spot on a cool day! 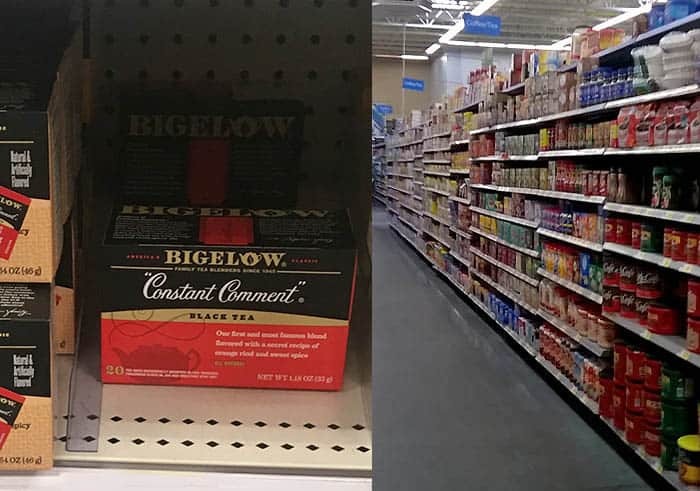 Hover over the image below to start shopping for Bigelow tea! 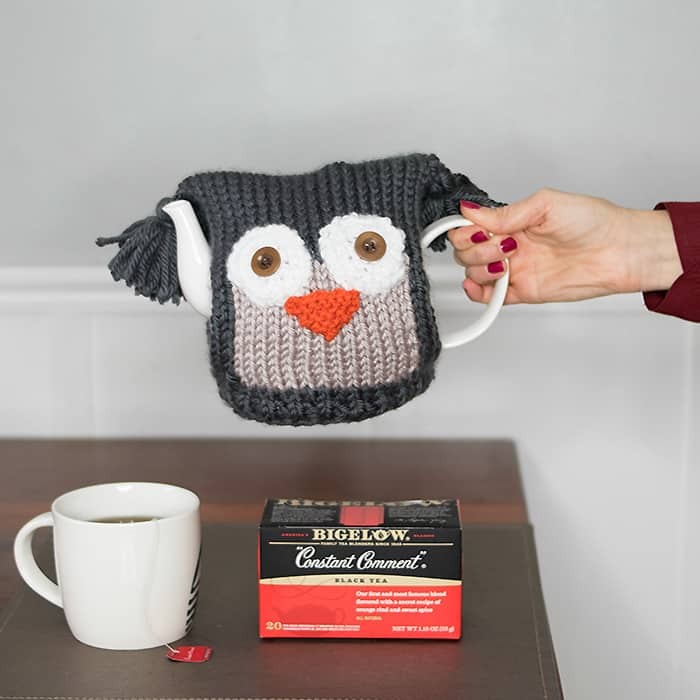 Bigelow is encouraging everyone to “Tea Proudly”. Tea Proudly is about celebrating the little moments in life that connect us and bring us joy. 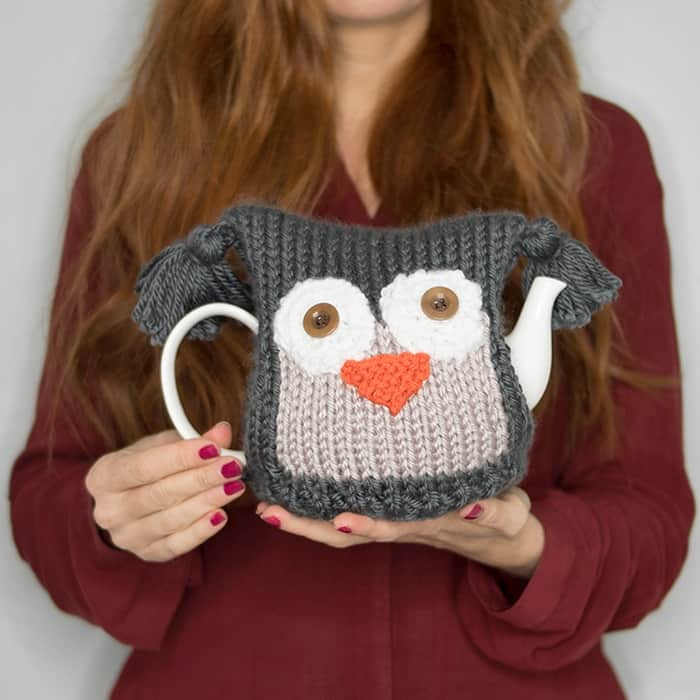 One of the ways I Tea Proudly is to dress up my teapot with a cute cosy. This little owl makes me smile every time I see him! Most teapot cosy knitting patterns aren’t beginner friendly. There’s usually double point needles and lots of increasing/decreasing involved. This knitting pattern is knit on straight needles and there’s no increasing or decreasing! The cozy is a rectangular shape, that gets folded over and sewn together at the bottom ribbing. Cast on 22 sts with the charcoal yarn. Work in K1, P1 ribbing for 3 rows. Work in Stockinette Stitch for 2 rows. Knit 4 sts, then switch to the biscuit yarn and knit across 14 sts. Attach another ball of yarn and knit 4 sts. Work in stockinette stitch using the 3 balls of yarn for 3 1/2 inches. Knit across with the charcoal yarn and break the biscuit yarn and the 2nd charcoal. Keep working in stockinette stitch until piece measures 15 1/2 inches from the cast on edge. Work in K1, P1 ribbing for 3 rows. Bind off. For the eyes (make 2): Crochet a circle that measures 2 inches wide. With the orange yarn, cast on 2 sts. Working in garter stitch, increase 1 stitch at each end until there are 8 sts. Bind off. Finishing: Sew on eyes, buttons and beak. Sew the sides together at the bottom ribbing. Make and attach tassels at the ears. Next time you’re in Walmart, be sure to pick up a box of Constant Comment from the Coffee & Tea aisle. They also sell all the yarn for this project- horray for one-stop shopping! How do you tea proudly? I’d love to hear!